Even prior to the vicious attack on Israeli civilians along the Israeli-Egyptian border, it was clear that the Sinai border was not being defended adequately. However, from 1979 until recently, it had indeed been a peaceful border with few exceptions, drawing tourists from Israel and abroad. However, over the last few years there has been a continual increase in the influx of illegal immigrants fleeing from African wars, with at least 2000 asylum or job seekers entering Israel illegally during the last month. There has also been a suspicion that organizers are taking advantage of some of those fleeing hunger and war since, if Israel did catch and turn them back, it could be used to accuse Israel of crimes against humanity. As a result of this infiltration, Israel has begun to build a security fence hoping to prevent just the kind of terrorist attack that indeed occurred in August of 2011. Another issue is that over the last few years Al Qaeda has infiltrated the rugged terrain of Sinai. Al Arabiya News on Sept 1st, 2011, reported that Bin Laden’s physician, Ramzi Mowafi, has been training terrorists in Sinai. While Egyptian security sources are trying to deny or downplay the importance of this information, Israeli security has warned for more than a year that Al Qaeda and other extremist Islamic terrorist groups were setting up a base in the Sinai Peninsula. As we noted in an earlier article, Al Qaeda in Sinai — Threatens more than just Israel, 08/02/2011, this is a danger, not only to Israel, but to the whole Middle East and all countries relying on the Suez Canal for shipment of oil and other goods. While the Palestinian terrorist organization, the Popular Resistance Committees (PRC), a terrorist arm of Hamas was found responsible for the recent attack by Israel, they do not operate alone. Several Islamic extremist groups are cooperating in an attempt to set up an “Islamic emirate” in Sinai and are funded by Al-Qaeda. Now the Islamic Brotherhood is demanding a voice in the ‘new’ Egyptian administration while, at the same time, Israel is considering renewed negotiations in order to allow Egypt to militarize the Sinai to cleanse it of terrorists. Already Israel has twice given approval to Egypt to bring additional tanks and troops into Sinai in hopes of regaining control. For its part, following the recent attack, Egypt is considering setting up a buffer zone on its border with the Gaza Strip. Zone A is bounded on the east by line A (red line) and on the west by the Suez Canal and the east coast of the Gulf of Suez, as shown on Map 1. An Egyptian armed force of one mechanized infantry division and its military installations, and field fortifications, will be in this Zone. c. Seven field artillery battalions including up to 126 artillery pieces. d. Seven anti-aircraft artillery battalions including individual surface-to-air missiles and up to 126 anti-aircraft guns of 37 mm and above. f. Up to 480 armored personnel vehicles of all types. g. Up to a total of twenty-two thousand personnel. Egyptian security services claim to have knowledge of all extremist groups, their training camps and to be closely observing their activities. We see however that Egypt too was caught off guard by the last attack and the attacks on their gas delivery systems. 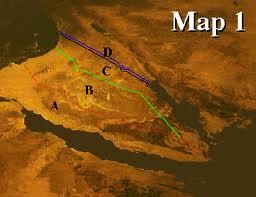 What about the Gaza buffer zone (with its terror/smuggling tunnels)? Do they intend for the UN forces to defend that? Would they allow Israel to defend that? and What would they do if Israel entered the buffer zone seeking terrorists and armaments? Note the Egyptian public’s reaction to the deaths of Egyptians soldiers when Israel was chasing the terrorists following the last attack! There was a 4-day demonstration outside the Israeli embassy. Egyptian protesters, angry about the deaths of Egyptian security personnel on the Israeli border, demanded the peace treaty be completely annulled. 1. Israel could allow sufficient temporary Egyptian militarization of the Sinai, risking extremists taking command of a huge military force created on her southern border. 2. Israel could take control of Sinai temporarily with Egyptian agreement in order to cleanse the Sinai of the terrorists, risking a long, costly Afghanistan-style battle. 3. Israel could assist Egypt in the efforts to clear terrorists from Sinai by providing intelligence assessments and limited air or ground support. 4. Israel and Egypt could renegotiate the entire peace treaty to restore peace and Egyptian control in Sinai, hoping that the Muslim Brotherhood will not demand new terms which endanger Israel’s security. At present, Egypt is very busy trying to reconstruct their country and looks likely to lose a significant measure of control to Islamic extremists who are violently anti-Israel. So any agreement made now is quite likely to be canceled or at least ignored by a future government. For now, no matter what Israel has done, is doing or will do to placate the Egyptians, the security fence must take priority and intelligence must be accurate and timely. Given the anti-Israel sentiment in Cairo especially over the past few weeks, it appears likely that the southern border (Sinai, Egypt — Muslim Brotherhood, Al Qaeda, PRC) will end up like the northern border (Hizbollah, Lebanon — Iran, Syria). No matter how we view it, the chaos created by the so-called Arab Spring, is being successfully used by the Islamic terrorists to threaten Israel on every side. One Response to Renegotiate Israel’s Peace Treaty with Egypt?